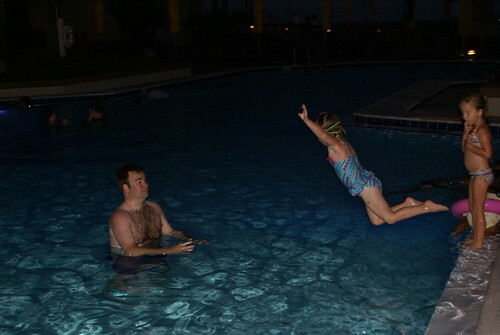 More pictures from Florida...come on, I know you are excited...haha! The place we stay hosts lots of weddings. We didn't see any while we were there this year, but we usually do. The girls LOVE weddings. 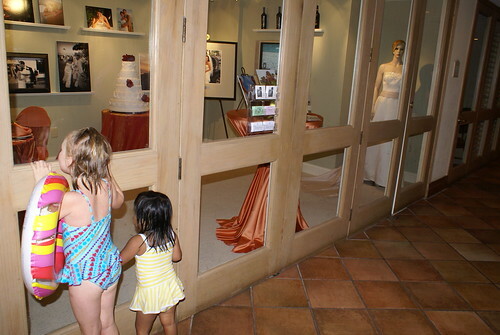 There is a room set up in the hotel that displays a wedding cake, wedding dress, place settings, etc. The girls L-O-V-E-D this room. Each time we passed, they wanted to look in :o) Hillary Ashton told us that she wants to get married at the hotel when she grows up. Sophie Le quickly chimed in and started yelling "Me too, me too. I wanna get married too!" :o) It was so cute to watch them peering in the room and discussing the "beautiful decorations"! Start saving up now, Daddy! Elisabeth, I hope Noah likes beach weddings :o) Haha! 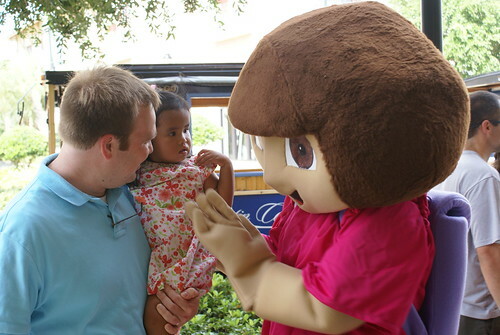 This little girl doesn't really like watching Dora on television anymore, but she was very excited to meet her "in real life." 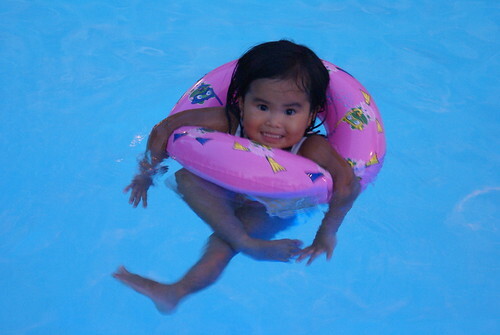 This little girl is a BIG Dora fan. 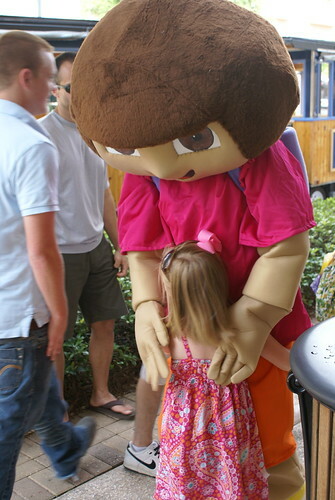 Dora is probably her favorite character right now. However, she had a very similar reaction to Dora as she did Mickey Mouse last year. She just doesn't like her characters being so big! 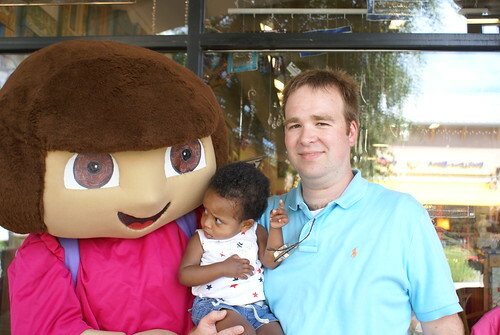 Daddy had to take her down the street right after this pic was taken because she stated bawling at the sight of Dora! I wish that would deter her from watching her on television! That Dora talks WAY too loud! 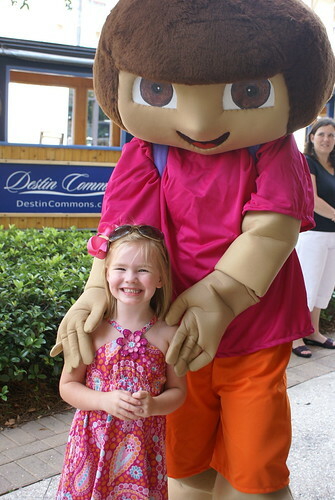 Julianne wasn't sure about Dora either! That face cracks me up! The girls have two very different methods to playing in the sprinklers. Hillary Ashton got drinched...big surprise. She finds a way to get wet almost everyday. I love seeing pictures of your girls. They are just precious. 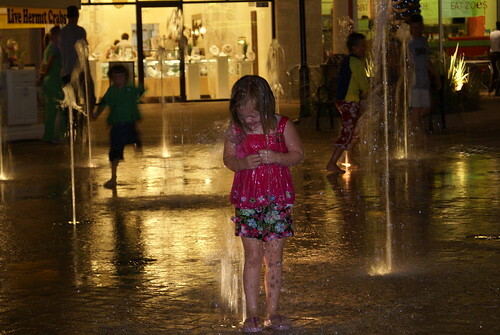 And Bennett is the same way about the fountains as Sophie Lee is. Too funny!!! Oh my word, what great pictures. 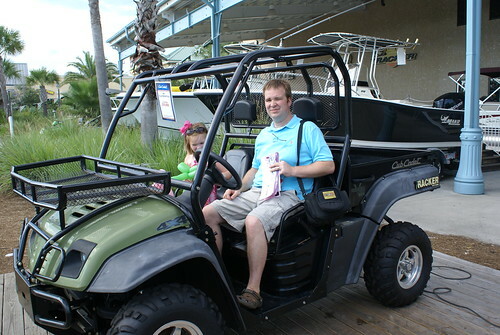 We were just in Destin ourselves at the beginning of August and we to are big fans of the Commons. I saw you had asked about our camera and it is a great one...it's an Olympus Stylus 1030 SW. 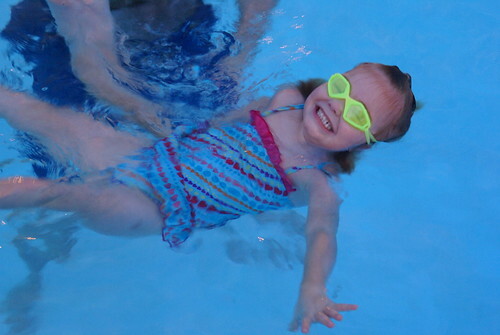 It is shock and water proof. I have dropped it and so have the kids and nothing has broken and I have soaked it more than once in apple juice with no harm done and obviously from the video it does great submerged in water. I bought it at bedford's and have been very pleased with it and really, it wasn't super pricey. Congrats on the new adoption as well! 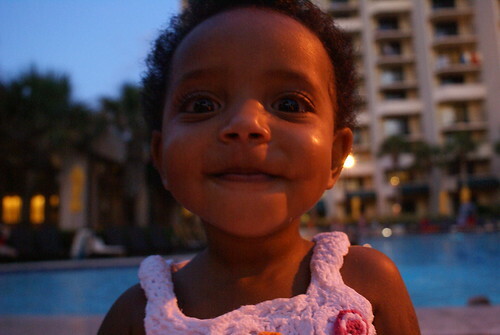 She is simply beautiful and looks like she fits her nickname: Joyful! !